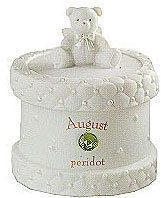 Porcelain Birthstone Keepsake Box - With pearlized accents, birthstone of the month and message underneath. " Priceless Memories Beyond All Measure, Tuck Them Inside For You to Treasure." Includes place for personalizing.